As many of you know I got my car driving again recently and I think that my alternator is not charging the battery. I guess tha car can run without the alternator if tha battery is providing enough juice? I'm leaning on just replacing the whole thing vs a rebuild. What are the brands to get or avoid? I read that I should get a new voltage regulator at the same time. Anything to get or avoid here? I have had a NAPA rebuilt alt in my car for years with no problems. But I am never more than 20 miles away from a NAPA store if it needs replacement. I would also guess new ones are really cheap, unless you need a high amp alternator or a single wire one. The reasons you might need a high amp alternator is if you have halogen headlights or an electric radiator fan. Both of those are large power hogs. A amplifier for your radio typically does not take that much power. A lot of people think it does, but that is not reality. So a standard 60 amp alternator could work fine, I have used it for 30 years, even with AC, high power amplifiers, and halogen headlights. A solid state regulator is a good idea at the same time. It is also a good idea to insure all the wires and connectors are secure and clean. Send your engine harness to Midlife and have him check it over, that will remove all doubt. Get on the road, summer is coming! Yes the car will run on battery alone. we used to run our race car that way. pill the thing and have it tested, the regulator could have failed and that could be the issue. Thanks. My local Auto parts store said they can test it on or off the car. Should I bother with that or just get the new parts? I'm thinking the latter since they are old and unreliable as it is. Where should I get the voltage regulator? Is there any reason you want to stay with the external regulator, if not just get a one wire alternator 100amp (you never know what upgrades you want in the future) with the built in voltage regulator. I converted to a late model Ford 130A alternator when I switched to electric cooling fans. Simple install, eliminated the external regulator, works fantastic even at idle, my pulley off my old alternator swapped on perfectly, and since they used these alternators in tons of popular models I can get a replacement at any parts store if I get stranded--> I want to road trip so this aspect was big for me. I junkyarded mine and it was cheap, and still works great. I have a 351w and made a simple extension bracket for the existing bracket for fitment. I tried reclocking the alternator case (to avoid needing the small bracket I made) bc the case interfered slightly with the cylinder head. Reclocking is totally doable (I've seen images) but I gave up in fear of breaking the aluminum case bc mine wouldn't budge. The bracket is a 3.5" long x 1" wide piece of 3/8" steel with 2 holes. Simple. When using the new alternator how does it affect the dipstick? I tested what I could and still suspected the alternator but I replaced the voltage regulator with one from Autozone. Still not charging. I think I also have some suspect wiring. I plan to contact @Midlife but here are the pictures. The wiring from the alternator had this patch with electrical tape and the tie in to the headlight harness spliced. 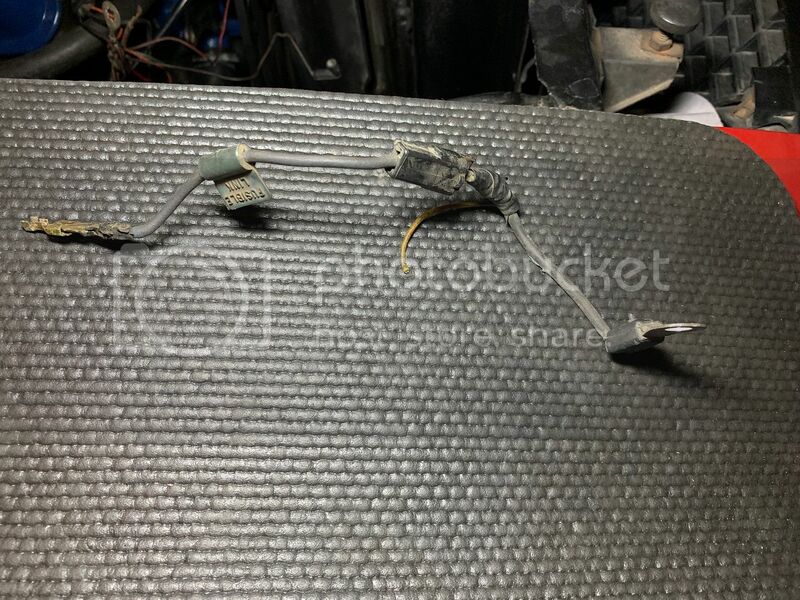 The two bare wires from the headlight harness were spliced to the last wire with the connectors in it. See the two cut wires in the middle. They are spliced to this wire that goes on the hot side of the solenoid. I don't know what the yellow was for. Red wire connects with big thick wire on one side of a splice; big thick wire and yellow wire goes on other side of splice. 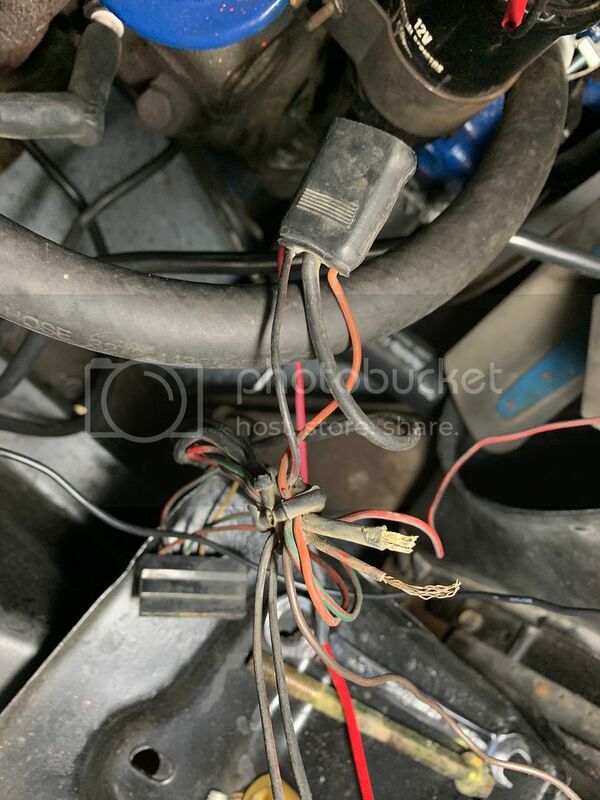 That big thick wire continues on to the starter solenoid, and the yellow wire goes into the VR connector and joins with the other yellow wire with the radio suppression capacitor via a bullet connector. The reason your battery is not charging is that you are missing the yellow wire going to the VR plug. Thanks! The yellow wire was the problem. Put it all back together with the old VR and a new yellow wire connected to the Voltage regulator yellow wire that only had the noise ballast plugged into it. Now I show 14V to the battery when the car is running! No new VR or Alternator required. I may still replace the VR with a solid state one. Those wires are a mess, they do not look good. You need solid connections and wires that are not corroded. No splices or wires held together with tape. Send it to Midlife and get it like new.